"Beautiful example from the 1860s, prior to the patent date. Painted oilcloth head, shoulders, lower arms, and lower legs with rare and earlier bare feet. Painted corkscrew curls in front of each exposed ear and short curls framing the forehead. Bulging painted eyes and painted mouth with hint of a smile. Wears a off-the-shoulder gold and red printed cotton dress, antique under garments, brown leather moccasin style shoes, and red bead necklaces. Comes with a rocker with woven seat in back. A few areas of crazing and slight splits to fabric above nose; possible minor old retouch above eyes and in open space above nose bridge. One slight bare spot to top of head and one horizontal split to hair in back. Condition (Good - Very Good). Size 19" T. "
UPDATE - the hammer price for this doll at auction was $8,000. Please visit the Morphy's site for more information. Wow! 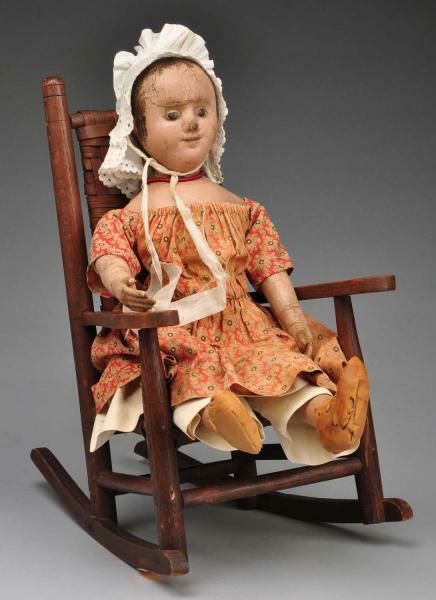 That antique doll was sold for a whopping $9,440.00. 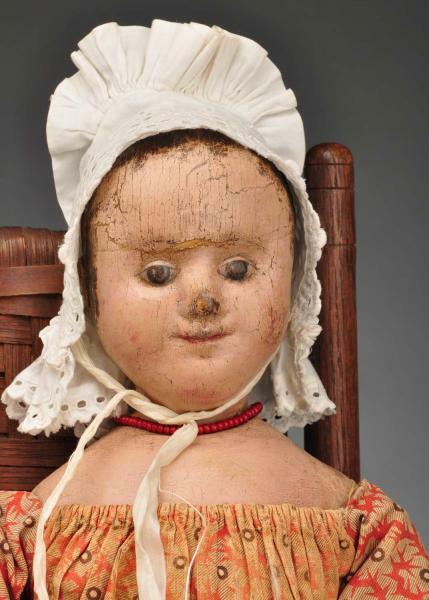 There's another doll in the auction house that was sold for $10,000. That's a lot of new dolls for my girls.